Not to be confused with Bobby V.
Robert Thomas Velline (April 30, 1943 – October 24, 2016), known professionally as Bobby Vee, was an American singer, songwriter and musician who was a teen idol in the early 1960s and also appeared in films. According to Billboard magazine, he had thirty-eight Hot 100 chart hits, ten of which reached the Top 20. He had six gold singles in his career. An active live performer into 2011, Vee was diagnosed with Alzheimer’s disease at which time he completed his scheduled tour obligations and recorded his final CD, which was released three years later. In 2014 he was inducted into the Scandinavian-American Hall of Fame. Vee's career began in the midst of tragedy. On February 3, 1959, "The Day the Music Died," three of the four headline acts in the lineup of the traveling Winter Dance Party—Buddy Holly, Ritchie Valens, and the Big Bopper—were killed in the crash of a V-tailed 1947 Beechcraft Bonanza airplane, along with the 21-year-old pilot, Roger Peterson. (Dion DiMucci, the fourth headliner, had opted not to travel on the plane.) It crashed near Clear Lake, Iowa, en route to the next show on the tour itinerary, in Moorhead, Minnesota. Velline, then 15 years old, and a hastily assembled band of Fargo schoolboys (including his older brother Bill) calling themselves the Shadows volunteered for and were given the unenviable job of filling in for Holly and his band at the Moorhead engagement. Their performance there was a success, setting in motion a chain of events that led to Vee's career as a popular singer. Dylan also recalled that Vee "had a metallic, edgy tone to his voice and it was as musical as a silver bell." Vee remembered that the musician he knew as Gunnn (Bob Dylan) "played pretty good in the key of C."
Vee and Karen Bergen married December 28, 1963. In the early 1980s Vee moved his family from Los Angeles to near St. Cloud, Minnesota, where he and Karen organized annual fundraising concerts to provide music and arts facilities for local children. They had four children, including sons Jeffrey, Thomas, and Robert, who performed with Vee in his later career, and daughter Jennifer. Karen died of kidney failure on August 3, 2015..
Bobby and his sons opened and operated Rockhouse Productions in an old bank building in St. Joseph, Minnesota, which continues in operation. The Vees helped organize and performed for a number of years in the annual July 3rd St. Joseph "Joetown Rocks" festival drawing many thousands of fans and area residents. Vee continued performing live until 2011 when diagnosed with Alzheimer's disease. In 2011, friends and family contributed to his final new recordings which were eventually released as The Adobe Sessions on February 3, 2014. On April 29, 2012, Vee announced publicly that he had been diagnosed with Alzheimer's and consequently would withdraw from the music business. He had been in memory care[further explanation needed] for 13 months in a long-term care facility in Rogers, Minnesota, just outside of Minneapolis, and eventually received hospice care in the weeks prior to his death. On October 24, 2016, Vee died from complications of the disease at the age of 73. ^ a b "1960s Pop Singer Bobby Vee Dies at Age 73". Billboard. Retrieved 2016-10-25. ^ "Bobby Vee - Chart history | Billboard". Billboard.com. Retrieved 2016-10-25. ^ a b c d e f Baenen, Jeff (October 24, 2016). "Bobby Vee, 1960s teen idol, dead at 73". CBC News. The Associated Press. Retrieved October 25, 2016. ^ a b "Images for Bobby Vee - Bobby Vee's Golden Greats". Discogs.com. Retrieved 30 March 2019. ^ a b c d e f g Laing, Dave (25 October 2016). 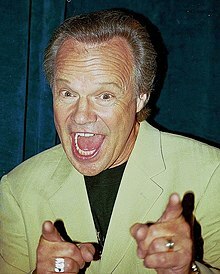 "Bobby Vee obituary: Singer whose infuriatingly catchy 60s hits included Rubber Ball and The Night Has a Thousand Eyes". The Guardian. Retrieved 31 October 2016. ^ Fuentes, Jerry (4 June 2012). "A Rock n' Roll Historian: Caravan of Stars Fall 1963 Tour". Retrieved 30 March 2019. ^ YouCanDanceToit! (10 November 2018). "American Bandstand 1963 -All Time Hits Day- A Little Bit Of Soap, The Jarmels". Retrieved 30 March 2019 – via YouTube. ^ "Bobby Vee". History of Rock. Retrieved 9 October 2014. ^ "The Bob Dylan Who's Who". Expecting Rain. Retrieved 9 October 2014. ^ Gerace, Adam. "If I Needed You". AdamGerace.com. AdamGerace.com. Retrieved 8 November 2015. ^ Kompas, Kate. "Karen Velline, Bobby Vee's Wife, Dies at 71". SCTimes.com. SCTimes.com. Retrieved 16 March 2016. ^ "1960s pop singer Bobby Vee has died at age 73". MPR News. Minnesota Public Radio. Retrieved 25 October 2016. ^ Jeff Baenen. 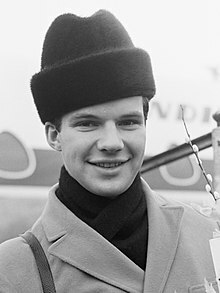 "1960s pop singer Bobby Vee dead at 73 - CBC News". Cbc.ca. Retrieved 30 March 2019. ^ "Bobby Vee". bobbyvee.net. Archived from the original on 2016-10-30. Retrieved 30 October 2016.